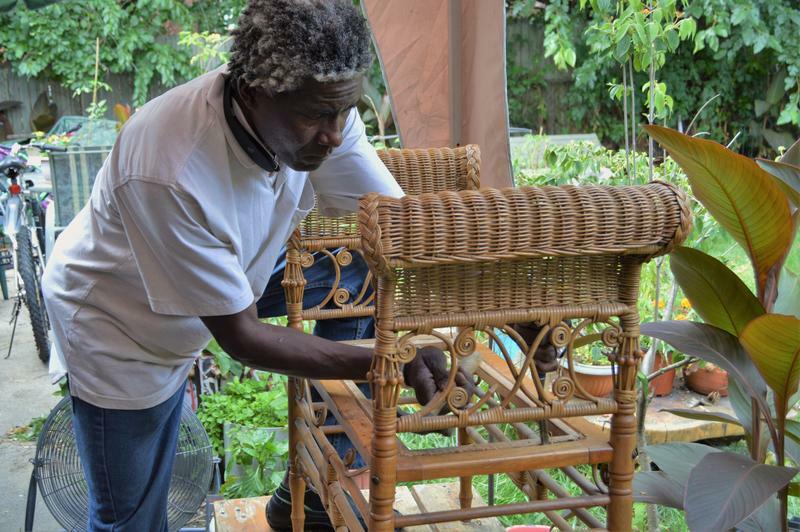 Babacar Lo is removing a damaged seat bottom from wicker furniture. You can see a video of weaving at the bottom of the story. 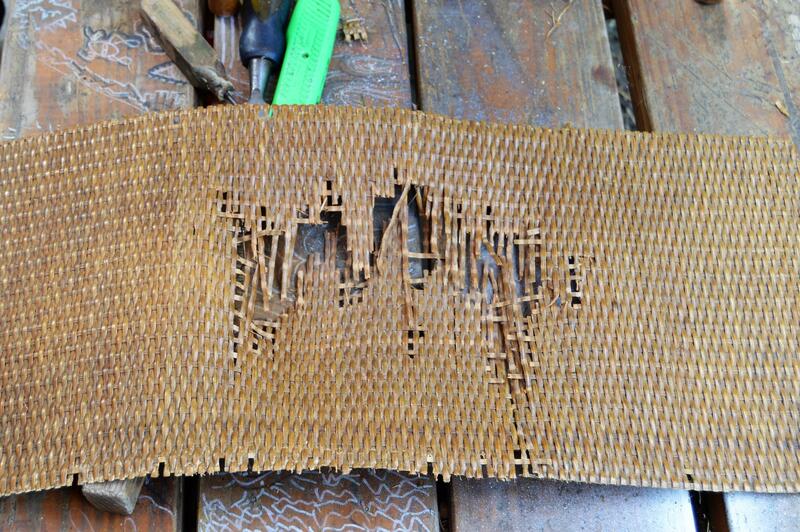 Often when caning becomes worn, people throw away furniture rather than repair it. 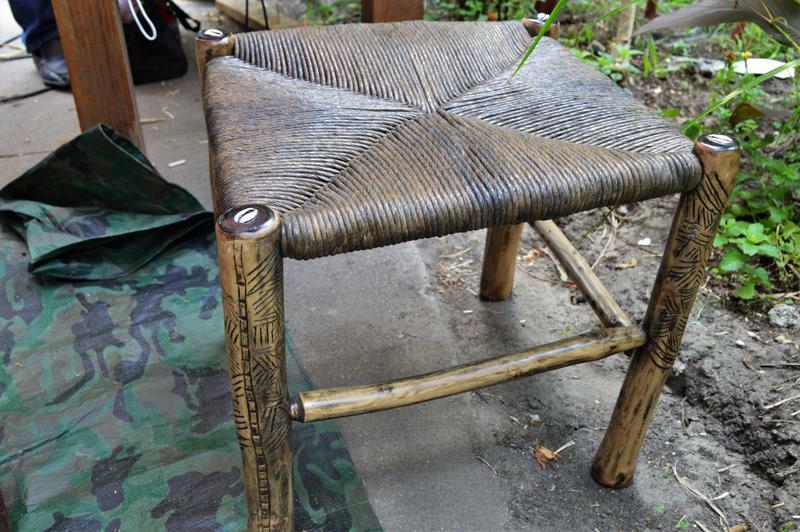 Babacar Lo also builds rustic furniture from found wood. Furniture designed and made by Babacar Lo. Listen to Babacar Lo talk about his work. A chair bottom being re-weaved. However, it wasn’t until he moved to the U.S. in the 1990s when he seriously took on the craft. He says he met a man in Hazel Park, Frank Henry, whose business was repairing wicker furniture. Lo worked with him in something like an apprenticeship. When Henry retired, Lo took over the business. We live in a throw away society. Lo says he used to see chairs put out on the street for trash pick up and he would take the good ones home, but there were just too many of them. He ran out of room in his house. “When I tell people the price to repair and they think about how much they paid for the chair, they’d rather throw it away,” Lo said. 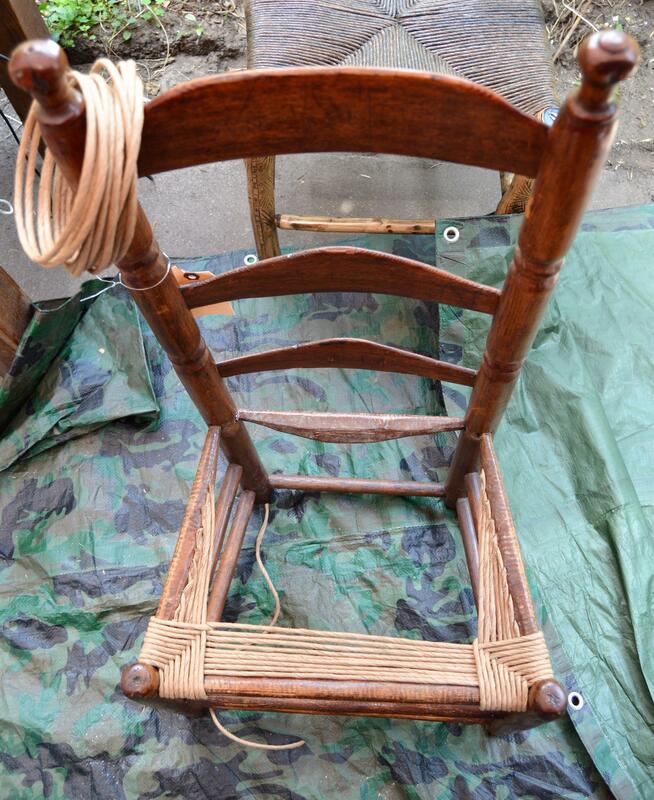 The exceptions to that are when the chair is an antique or has sentimental value for the owner. Many of the artisans in this series have said they like working solo. You can count Lo among them. During the winter months, he works in his basement alone. “I’m not that sociable really. 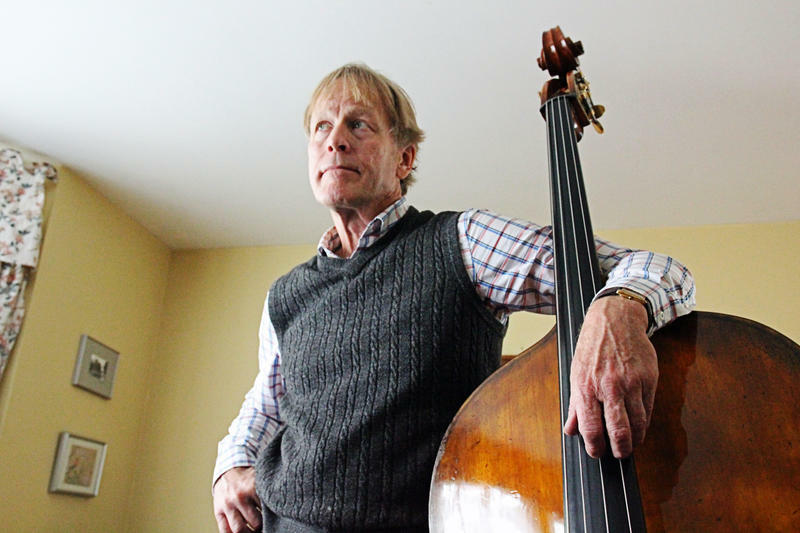 When it comes to working, I like my peace and being in my corner doing my work,” he said. That’s part of the reason he’s not taken on his own apprentice. He told me if someone could quietly stay around, watch, and learn, that might work for him. Lo says his parents wanted him to be a computer programmer. He went to school in France for it. But, his heart was not in it. He wanted to work with his hands, work with furniture like his Grandfather and his uncle did. Lo also builds rustic furniture from found wood. 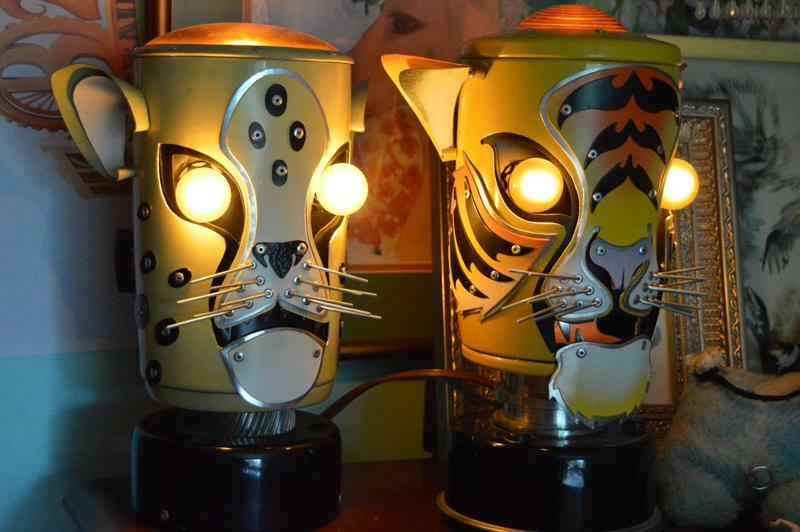 You can find photos of some of his pieces in the slide show at the top of the page. He’d like to do more of that art work, but re-caning and re-weaving chair bottoms, the commercial work, pays the bills. Artisans of Michigan is produced in partnership with the Michigan Traditional Arts Program of the Michigan State University Museum. Babacar Lo was a master artist with the Michigan Traditional Arts Apprenticeship Program in 1994. Listen to Kate Lewis as she works. Kate Lewis is adding to a big plastic bag of clay balls before she begins work at her pottery wheel.